Practice your skills, spend time with friends and family, or show off your figure skating moves during Body Zone’s Public Ice Skating sessions. Want to learn how? 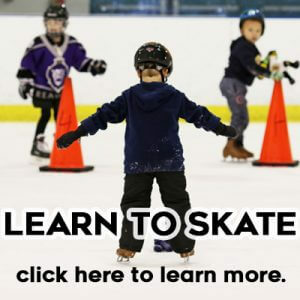 Register for Body Zone’s Learn To Skate program. Body Zone hosts public ice skating almost every day of the year. Please wear warm, comfortable clothing – gloves are recommended. Helmets are strongly encouraged for children under seven. No outside food and/or beverage is permitted inside Body Zone. The café next to the rinks is open for your enjoyment. Warm up with some hot chocolate! Weekend and holiday admission is just $10.00 for all ages and skate rental is $5.00. Weekday daytime public ice skating is only $5 for all ages and $3 skate rental (except when holiday/weekend rates apply). Groups rates are available, when scheduled in advance, at both our public ice skating sessions and also privately. Schools, churches, scouts, camps and more are all welcome. To inquire about bringing your group to a public skating session or to set up a private event, please contact Donna Faber-Lascoskie at 610-376-2100 x 283. Want to have a birthday party on ice? Learn about our Birthday Parties as easy as 1-2-3 and inquire today!